Singing Stones is a cultural group established by a young couple from Taiwan in Beigang village. Lin Jhihyuan and his wife Xu Lingsi established the group after they decided they needed a change from running their own business in the Pingtan-Taiwan Duty-free Commodity Market, now known as Taiwan Aaoqian Town. The couple was inspired to establish the club by a folk performance the couple saw in Beigang during a visit to the village several years ago. Local performers created music with rocks they had collected from a nearby mountain. The sounds they made were so beautiful they decided to name their club Singing Stones. Singing Stones has now become an important creative cultural communication platform for artists from both sides of the Taiwan Strait. A lot of artists from Taiwan visit in order to get inspired and many visitors from the Chinese mainland also come to experience the exquisite creative culture of Taiwan. Recently, the cultural group also performed on Southeast Television, a popular TV network in Fujian province, during its annual Chinese New Year gala for overseas Chinese. 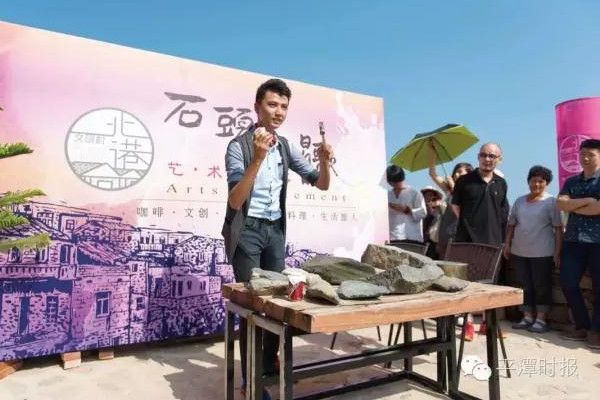 It is hoped that this will inspire more people to come and immerse themselves in the enchanting melodies sung by the stones in Beigang village.